A new name might feature for the Addicks in tomorrow's game at home to Huddersfield. Dave Mooney (don't you think that has a good old fashioned centre-forward ring to it?) has joined on loan today until December 1st from Reading. The word 'loan' has hardly been popular around SE7 these past couple of years, not since Scott Carson won player of the year anyhow. However due to Leon McKenzie being injured again, and Burton facing a hernia operation Parky used some of his old Reading contacts to move quickly to sign the 6' 2" striker on an 'emergency loan' and as New York Addick says hardly giving Izale McLeod a thumbs up, but it may put a rocket up his backside after being widely blamed for last week's loss of 2 points. 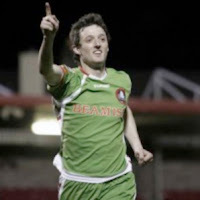 Irishman Mooney had a bit of a glittering early career in the Irish leagues with Longford, Cork City and Shamrock Rovers although he didn't appear to play many games his goal ratio was excellent. He then trod the well worn path of successful Irish League players to the Madjedski Stadium in August 2008 but was sent on loan to Norwich at the end of last season (he played at The Valley in the last game of the season). He has scored twice this season against Burton Albion for Reading in the League Cup in early August. Said to have a decent touch I would imagine that Mooney would be considered by Parkinson as a short-term replacement for Burton, but also as a target man who could play in a front two. The move for Mooney has made me realise that the club do not consider Chris Dickson the answer, as I believe we could recall him if Parkinson wanted to. Stuart Fleetwood is on a season-long loan at Exeter, so we have two strikers out on loan and are then enforced to bring one in on an 'emergency loan.' Rules is rules I suppose.